There are a 2 tastefully converted barns and 1 small compact detached cottage, with balcony, on this site. Each property is well equipped and has Sky TV and a DVD player. Unlimited, free Wi-Fi internet is available in each property. The houses are set in over an acre of secluded gardens with a superb 12m x 6m swimming pool, which has lighting, Roman steps and a solar heated shower. Our pool is now enclosed in compliance with the new pool safety regulations. There is a children's play area with swings, covered games area with table tennis, and there is a selection of bicycles for guests to use. Each house has its own patio area with garden furniture and barbecue. There is a beautiful nature reserve nearby, which offers boating, fishing and nature trails. Although the setting is rural with stunning views, there are plenty of supermarkets, restaurants and things to do and see nearby. Come and have a relaxing holiday! Downstairs: Entrance verandah and cupboard with automatic washing machine. Dining/kitchen and sitting room. Well equipped with gas cooker, microwave and fridge. There is a TV with DVD player. Open plan staircase with handrail leads to the upstairs bedroom. Shower room with washbasin, toilet and shower compartment. 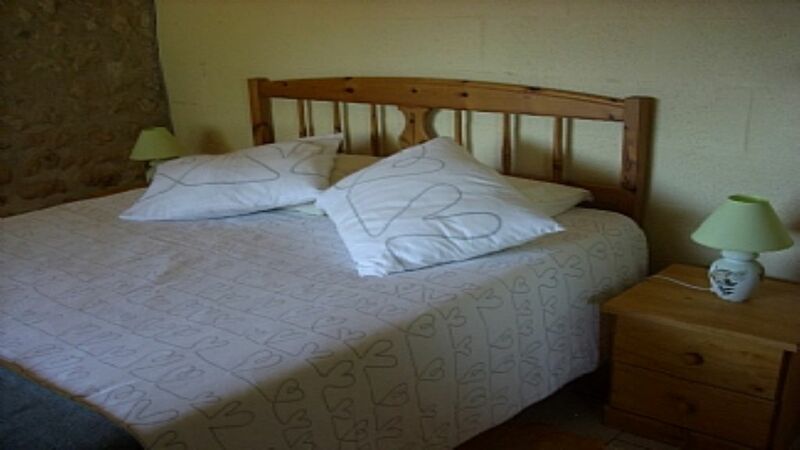 Upstairs a comfortable and bright double bedroom with double bed. Free to view English channels. Set in a lovely rural location with farmland views from the gorgeous pool. Thanks for your lovely comments. Was a pleasure to meet you and have you stay.